"Great cookies that look and taste great. Perfect for holidays such as Christmas or Saint Patrick's Day." Combine butter, white sugar, and brown sugar in a large bowl; beat with an electric mixer until creamy. Beat in eggs. Stir in vanilla extract and peppermint extract. Dissolve baking soda in hot water and mix into the batter. Combine flour, salt, and cream of tartar in a separate bowl. Add to the batter gradually; mix well. Stir in chocolate chips. Drop spoonfuls of batter onto ungreased baking sheets. Bake in the preheated oven until edges are nicely browned, about 10 minutes. Cool on the baking sheets for 1 minute; transfer to a wire rack to cool completely. Try these addictive cookies, featuring milk-chocolate chips. Mmm. 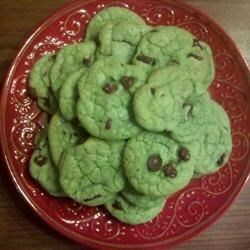 Try using creme de menthe chocolate chips or chopped Andes® mints. Made these for church on Sunday, one batch with peppermint and one with almond. I didn't even get to sample one they were gone that quick.